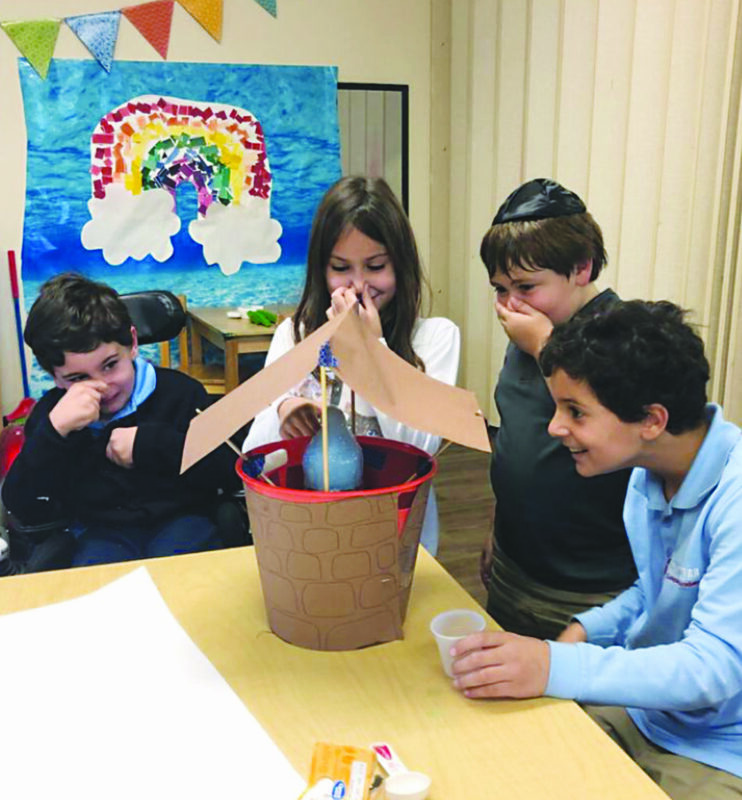 From left: Noam Swisa works on a project at Chabad of Plano’s Hebrew School with classmates Maya Kahlom, Oriya Azo and Asher Simon. The recipe for community is no doubt one part need and many parts soul, one part request and hundreds of parts caring. The recipe for support for 8-year-old Noam Swisa, who lives with cerebral palsy and needs surgery, is one part Noam and many parts everyone. Two upcoming fundraisers will help defray the costs of Noam’s surgery. Proceeds from 3 to 7 p.m. on Monday, Jan. 28, at Benny’s Bagels at Ohio and Frankford in Far North Dallas, and the Mega Challah Bake for Noam, from 7 to 9 p.m. on Thursday, Feb. 5, at Congregation Tiferet Israel, will help bring the taste of success to this child. “This boy, this Noam, is as sweet as can be, and we must help him have a chance,” said Michal Azo, a friend of the Swisa family. Azo — who created a GoFundMe page raising (at press time) just over $40,000 of the $150,000 needed for Noam’s selective dorsal rhizotomy (SDR) surgery — is spearheading the challah bake with Meital Dov Rosbruch and Sarit Sabo. Isaac and Ifat Banai’s Benny’s Bagels and Sharon and Vered Kabilio’s Midtown Pizza are donating food for challah-bake participants; Congregation Tiferet Israel is providing the space; and Liron and Ronen Telman, who own Aderet, are supplying the challah ingredients. By offsetting these costs, all donations to the challah bake will support Noam’s surgery and associated care. Rachel Ben Yaish became concerned when son Noam, born at 39 weeks by emergency Cesarean section, wasn’t meeting developmental milestones. At 4 and 5 months, he wasn’t crawling, controlling his head or moving his left arm. Then he wasn’t sitting up when others his age were. After seeing a neurologist, the cerebral palsy diagnosis came. Second and third consultations confirmed. At a level 4 of 5 in severity on the Gross Motor Function Classification System, Noam’s muscle tone causes poor coordination and movement limitation. He can walk, with a walker, only a few steps at a time. He can’t stand or sit, feed himself or manage almost any everyday activity. Noam’s best hope is the surgery, which the family is hoping will be done by the procedure’s “father,” Dr. Tae Sung Park, a neurosurgeon who is also director of the Center for Cerebral Palsy Spasticity at St. Louis Children’s Hospital. Park, with thousands of procedures completed, has patients from the United States, Canada, China, Israel, Switzerland and elsewhere. For Noam’s future, the family believes making the trip to St. Louis to release the spasticity through the surgery to his spine is a must. The logistics of surgery far from home are significant to the family, which also includes 4-year-old Romi. They expect to be gone one to three weeks for surgery and post-op recovery and therapies. Both parents work in Dallas — he as a cosmetics production professional and she as a therapy assistant. Being uprooted adds to their stress. “This is what we must do now to help our son — it’s much sacrifice, but it’s for his best life,” said Rachel. She and husband Dror are from Israel, but they met in Dallas. “The fact that Noam is alive is a miracle in itself. We want to make that life one that lets him move and walk and live his best life. The surgery isn’t covered by our insurance or Medicare, so we must ask for help,” said Rachel, appreciative that much of Noam’s care has been covered — at least partially — including his therapies, power and manual wheelchairs and a Rabbit Mobile Stander (a vertical mobility tool). While everyone works to ensure his future, Noam, who turns 9 on Feb. 10, wishes only not to be bound to a wheelchair, but to play tag, to hold his water bottle and fork, to play video games — to be a typical child. RSVPs for the women’s only Mega Challah Bake for Noam, $20/person, and other donations can be made by PayPal at heliby7@yahoo.com or tinyurl.com/NoamSDRsupport or click “going” on the Mega Challah Bake for Noam Facebook page and pay cash at the door.